Home » Customer Testimonials » Holidays are upon us! The Holidays are upon us and Oahu is the Gathering Isle. We have everything you need for your holiday festivities, especially your essentials, like tables, chairs and tent rentals. We have low prices for the Holidays. 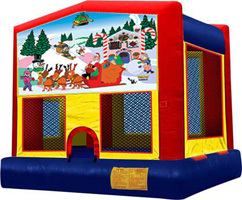 Add some flair to your event and book the Christmas Theme Bounce house rental!